Thank you to all of the coaches, athletes, family and friends that have worked together so far this year. Here is an update on the indoor track teams! Congratulations to the members of the Girls Indoor Track team on their Conference 29 Championship! Event champions were Annie Taylor in the 1600, 1000 and 500; Taylor Catlett in the 3200; Lydia Garner in the High Jump; Sarah Tolman in the pole vault, Nichole Heon in the 55 and triple jump; the 4×800 relay team of Annie Lorenzoni, Avery Jordan, Faith Reid and Zoe Clay and the 4x200m relay team of Katrina Barredo, Madison Masloff, Nichole Heon and Deborah Ayres-Brown. 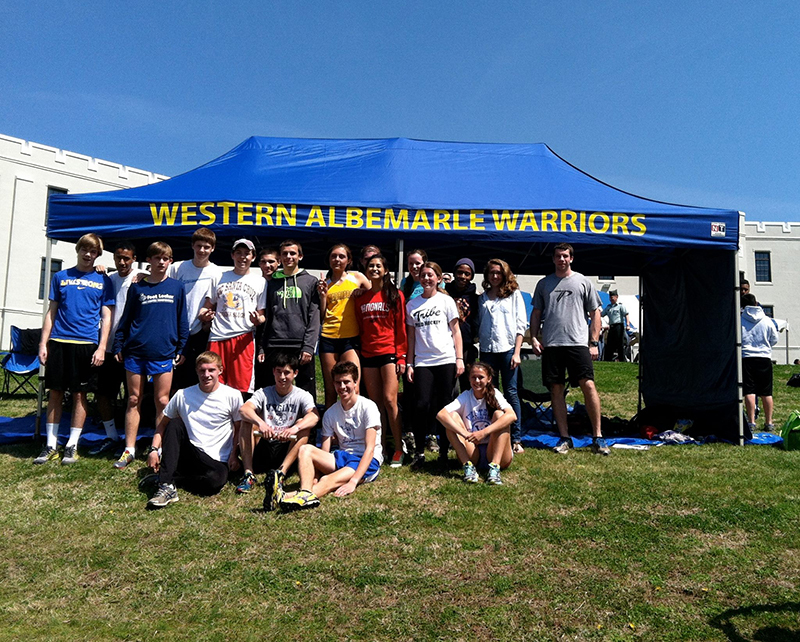 Second place finishers were Chance Masloff in the 1600 and 1000; Abby Zimmerman in the triple jump; Katrina in the hurdles; Caroline Outlaw in the 500; Madison Masloff in the pole vault and the 4×400 relay team of Caroline, Zoe, Chance and Madison. Third place finishers were Caroline Outlaw in the hurdes; Emma Ratcliffe in the 1600; Nichole Heon in the 300 and long jump and Katrina in the pole vault. Madison Masloff finished fourth in the 300 and Jess Meeks was fourth in the pole vault. 5th place finishers were Zoe Clay in the 1000, Sarah Titus in the 3200, Jess Meeks in long jump and Caroline Outlaw in the high jump. 6th place finishers were Abby Zimmerman in the long jump and Faith Reid in the 1000. The Boys Track and Field team finished second in the Conference 29 Championship! The team’s conference champions consisted of Gannon Willcutts in the 1600M, Trevor Stutzman in the 3200M, and the boys 4 x 800 M relay of Aaron Cole, Matthew Capshaw, Will Koaster, and Ethan Sewell. The team had silver medalists of Caleb Rider in the pole vault, and 55M hurdles, Trevor Stutzman in the 1600 m, and Gannon Willcutts in the 1000 m. The team also had bronze medalists of Jack Ehlenberger in the 1600 m, and the 3200 m, Blake Tolman in the pole vault, and the 4 x 400 relay of Ethan Sewell, Matthew Capshaw, Aaron Cole, and Gannon Willcutts. I’d like to take the time to thank everyone who generously volunteers their time, energy, and funding to make Friends such a supportive organization. Lindy and I were humbled by the generosity regarding funding of our trip to San Diego to support Gannon at Foot Locker Nationals. The trip was a blast and I’d like to share a bit about it for anyone who wishes to continue reading. By finishing seventh in 15:01 at the Foot Locker South Regional Meet, Gannon became the fourth Warrior to qualify for the National Meet and the first to do it as a junior (Mark Smith, 1990, Kyle Satterwhite, 2008, Mattie Webb, 2010). 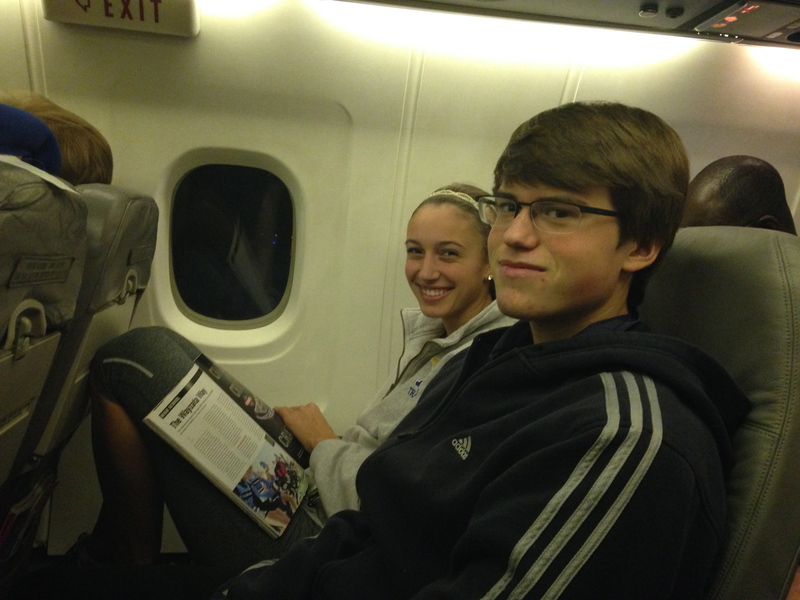 On Thursday, December 11th, we left the Charlottesville airport at 5:15, meaning we got to CHO at 4:00 in the morning. Yikes! When we arrived in San Diego, Gannon was promptly whisked away by the Foot Locker folks. I firmly believe he was treated like royalty from the moment we touched down until the moment he left on Sunday morning. 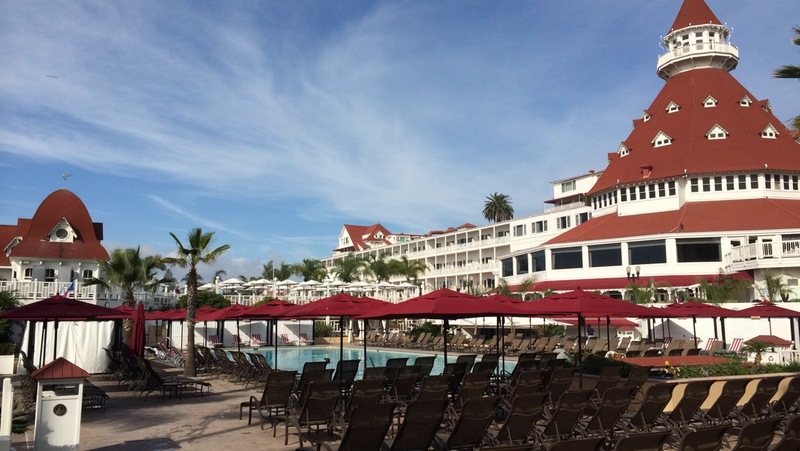 The meet headquarters was at the Hotel del Coronado. You might want to Google image search that name, dear readers, for my photos below surely won’t do it justice. Simply put, the hotel was majestic. When Gannon was off participating in official activities with the other athletes, the rest of us had a blast reading by the pool, exploring the beach, and meandering through the little shops in and around the Hotel del Coronado. We ate delicious Mexican food on a number of occasions in addition to attending a formal banquet hosted by meet management. Perhaps the best meal of the trip for me was at a small sushi joint on Saturday afternoon after Gannon’s race. Athletes, coaches, and parents alike were lucky to hear from elite athletes on multiple occasions, including Alan Webb, Adam Goucher, Deena Kastor, Meb Keflezighi, Kara Goucher, and many more. Now let’s get down to business: running. We previewed the course on Friday morning and it was sloppy. An uncommonly persistent rainstorm lasted pretty much all day, which saturated the course thoroughly. The lush grass became extremely spongy in places and one steep downhill in particular became really slick and slippery. By Saturday the weather had cleared up, but the course was still a little more damp than desirable. I was really proud to see Gannon wearing his usual shoes, pants, and jacket in which to warmup on Saturday morning. Many of the other athletes were sporting their new Asics gear. The gifts were ample, but really, couldn’t those kids have waited until after the most competitive race of their season to try new out new gear? Come on, people; dance with the one that brung ya! The race itself went well! Gannon managed to stay on his feet the whole time, which is more than some athletes were able to say. He made a big move sometime between 1.5 and 2 miles and gained a lot of ground on the pack. It was nice to see Gannon really competing and mixing it up with this national caliber field instead of being satisfied just to have qualified. He finished in 16:04 for 28th place. 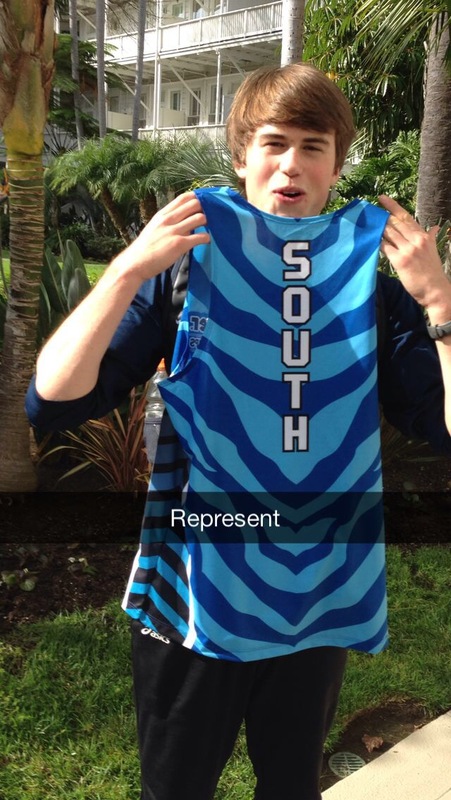 Despite finishing 7th at the South Regional, Gannon was the 4th finisher on the South squad at the National meet. 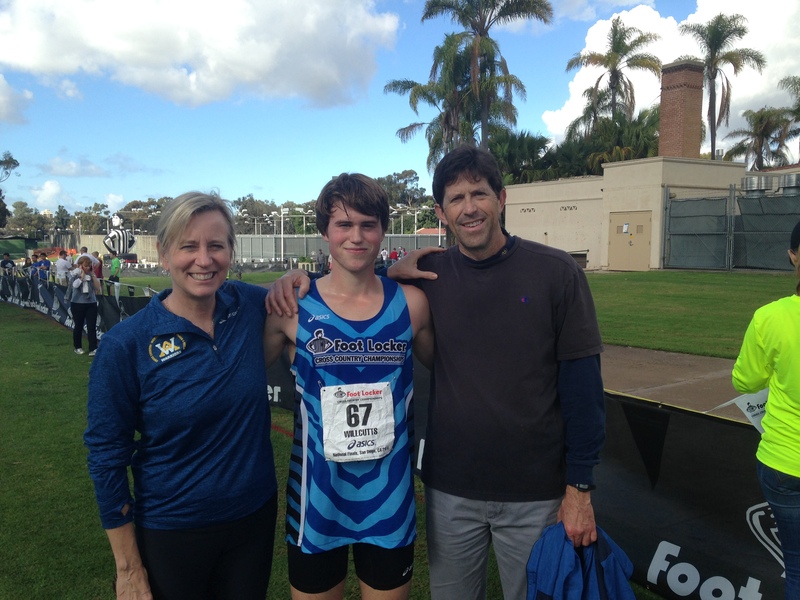 In addition, he was the 7th junior the cross the finish line in San Diego. Apologies to those of you trying to watch the live webcast on Foot Locker’s website. I understand it was pretty choppy this year. All in all, the trip was a great experience for everyone involved. Getting some experience with such a competitive field and seeing the course could pay dividends in the future for Gannon. Lindy and I feel privileged to coach such a dedicated and humble young man. Now it’s back to track season for the next 7 months! Thanks again for all of the continued support and generosity! Gannon and Chance at 5:00 in the morning, having been up for at least 2 hours already! 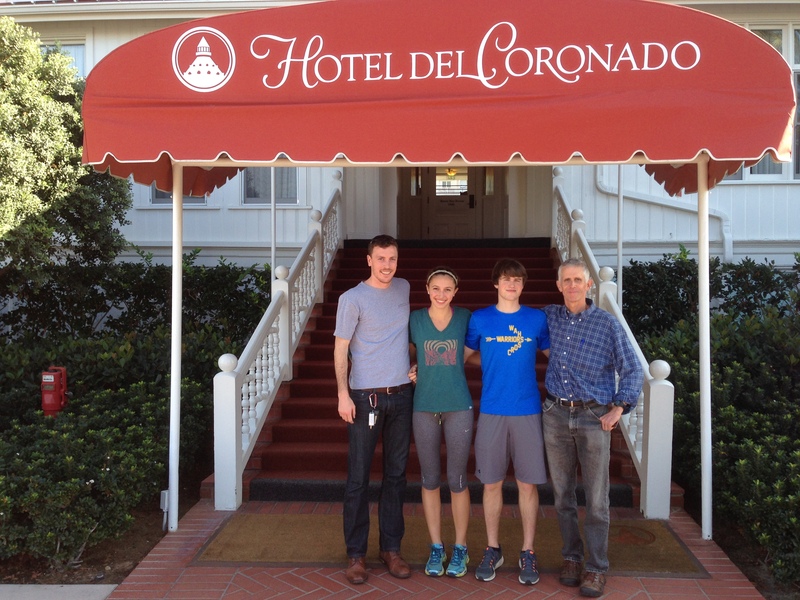 Cass, Chance, Gannon, and Lindy on the rear steps at the Hotel del Coronado. The view from the porch off Cass and Lindy’s room. Gannon showing his excitement at his race uniform! Gannon with parents Kate and Brian after the race. 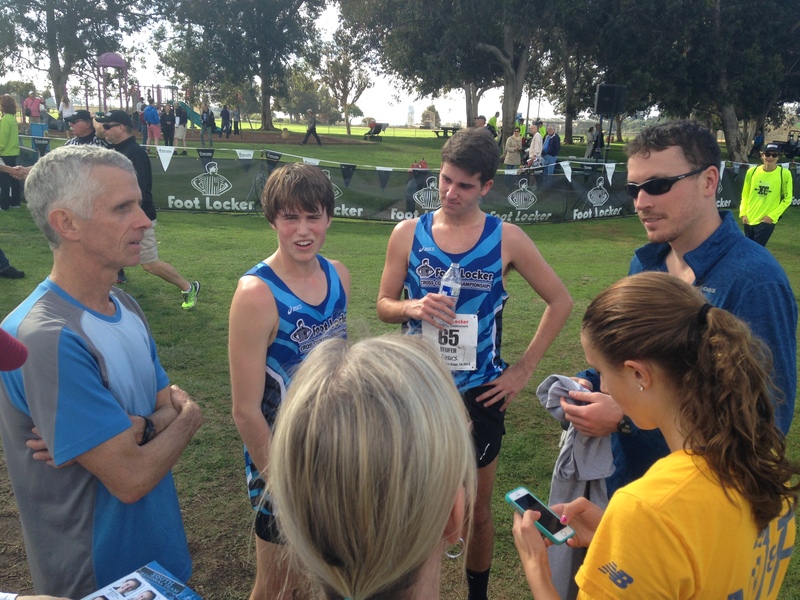 Gannon and Peter Seufer (EC Glass High School in Lynchburg) compare experiences after the race. 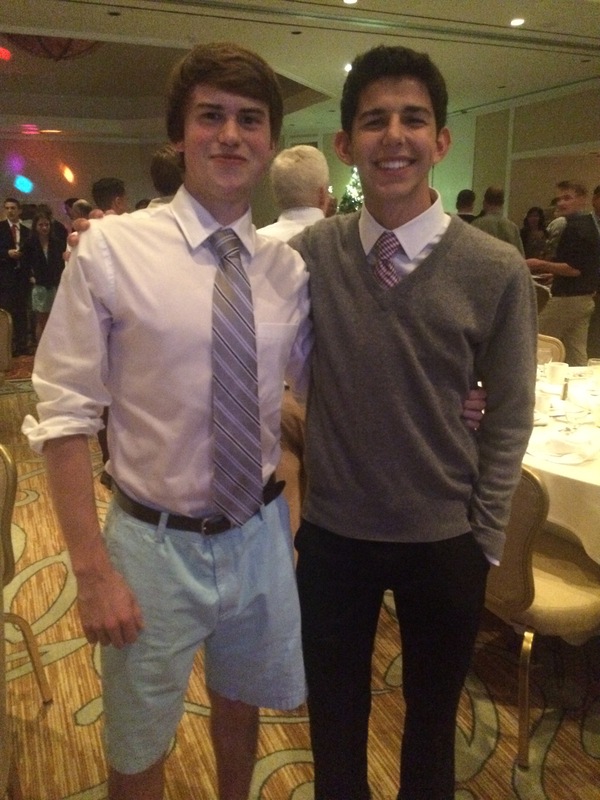 Gannon with two time race winner Grant Fisher at the banquet. Friends will receive 40% of the proceeds from the concessions. That helps us provide our wonderful assistant coaches with stipends as well as make one-time purchases such as this 10′ x 20′ new team tent.